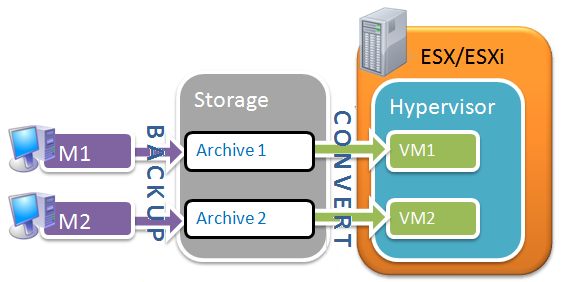 You can set up a scheduled or immediate conversion of a backup to a virtual machine format. This will allow you to have a copy of your server or workstation on a virtual machine which can be readily powered on in case the original machine fails. The conversion can be performed by the same Acronis Agent that performs the backup or by an Agent installed on another machine. If the latter is the case, you need to store the archive in a shared location, such as a network folder or a managed vault, so that the other machine can access the archive. Select Convert in Convert to virtual machine and adjust settings: set when to convert the backup to a virtual machine, select the format by clicking Target host, select where to put the converted machine under Storage, give a name to the virtual machine. See also Acronis Backup 11.5: Converting Backup Archive of a Windows System to a Virtual Machine.